I grew up in Philadelphia, Pennsylvania. My father and his six brothers were in the rag trade. They manufactured women’s clothing. Over the years the business mutated through many forms, from high-end, fur-lined raincoats to bargain basement ready-to-wear. Often, the Apfelbaum boys were way ahead of their times. They would have clothing lines designed that would bomb totally with the clothing buyers. 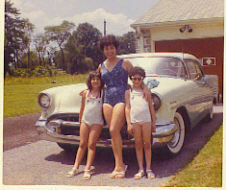 Yet, strangely, when the women of the family would wear samples of these outfits, strangers would stop them on the street to learn where the clothes had been purchased. One of these daring experiments was the “Bow-Wow” line. “Bow-Wows” was an intriguing idea consisting of matching children’s and dog coats. To illustrate the way the clothing would work, two different modeling systems were created. One of them was a pair of extremely expensive stuffed dogs, which later provided me with a painfully embarrassing memory. The other required the participation of the seven cousins who, at the time, were old enough to walk. Thus, one fine Philadelphia morning, the seven of us were awakened by our parents and bundled off to Rittenhouse Square. There, we were dressed in cute little coats and introduced to our hearts’ desire: six dogs of differing breeds, each dressed to match a child, or in one case, a pair of children. The years passed, we grew up and apart. We went on with our lives and moved to new cities. Twenty years passed, and one day in a drawer, there it was, the photograph commemorating the event. 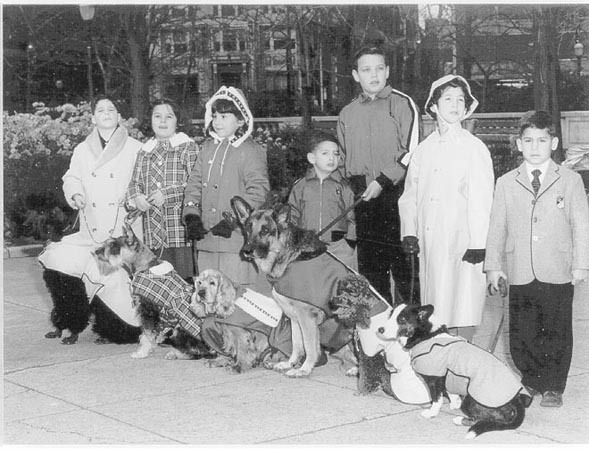 Kids in coats with dogs in coats, a vision of an innocent age long ago. I'm the third from the left.